Researchers at the National Institutes of Health (NIH), led by visting fellow Dakai Jin, developed a deep learning-based system to automatically inpaint and detect pulmonary nodules, which are round or oval-shaped growths in the lung. Using NVIDIA Tesla GPUs and the cuDNN-accelerated Caffe deep learning framework, the team trained their 3D conditional generative adversarial network on over 1,000 lung nodules. Once trained, the system generated thousands of additional synthetic lung nodules with different shapes and appearances. 3D CGAN architecture for lung nodule generation. The input is the original CT VOI, y , containing a real nodule and the same VOI, x , with the central region erased. Channel numbers are placed next to each feature map. 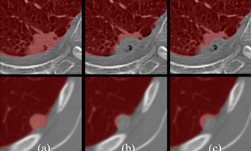 Jin says that by using this synthetic training data, he and his team were able to significantly improve the performance of pathological lung segmentation. Lung segmentation results when compared to three other neural networks. When compared to three other neural networks – the proposed CGAN produces the best results in dice scores, Hausdorff distances, and average surface distances. Dice scores improve from 0.964 to 0.989. The Hausdorff and average surface distance are reduced by 2.4 mm and 1.2 mm respectively. In terms of visual quality, the proposed network produces considerable improvements in segmentation mask quality, the researchers said. The paper was published on ArXiv, and will be presented at the 21st International Conference on Medical Image Computing and Computer Assisted Intervention (MICCAI), September 16 – 20 in Granada, Spain. AI Helps Map Every Building in the U.S.